Marinescu's comprehensive book chapter on the music of Horatiu Radulescu will be published by Oxford University Press in late 2019. During the last week of May, Marinescu will give a composition masterclass at the National University of Music in Bucharest. After almost three decades, String Quartet No. 1 will be performed again in Romania on May 26, during the Bucharest International Week of New Music Festival. Bent for piano and electronics will be presented during the Hear Now Music Festival on April 30, at the Throop Unitarian Universalist Church in Pasadena. A-Gain for chamber ensemble was performed at California State University Northridge by Brightwork newmusic on March 10. On March 5, Brightwork newmusic performed A-Gain at California State University Dominguez Hills. The Sound and Fury Concert series at the Church of Truth in Pasadena presented a performance of A-Gain with Brightwork newmusic, on March 3. On February 24, Brightwork newmusic performed a newly revised version of A-Gain for chamber ensemble at Harvey Mudd College, in Claremont, California. A-Gain was performed on February 24 by the San Diego State University Chamber Orchestra under the direction of Michael Gerdes. On February 1, Marinescu's String Quartet was performed at the Wende Museum in Los Angeles by the Lyris Quartet. Moto Perpetuo for chamber ensemble was performed on January 24 at California State University Northridge during ChamberFest 2019. Shadows for piano and electronics was performed on November 27 at the Grains of Sound Electroacoustic Music Festival in San Francisco. On November 16, Marinescu presented his works and gave a composition masterclass at the San Francisco Conservatory of Music. Harmonic Fields was performed on November 10 by the AdHoc Ensemble at the Meridian International Festival of New Music in Bucharest. Game Ensemble performed Speak & Spell on October 7, during the Contemporary Music Days Festival in Bacau, Romania. A brief note about the upcoming performance of String Quartet No. 1 at the Wende Museum in Los Angeles aired on Pacifica Radio, on September 20. A video recording featuring Brightwork newmusic's performance of Harmonic Fields in March 2018 is now available on YouTube. Brightwork newmusic gave a performance of Harmonic Fields on June 26 at Monk Space, in Los Angeles. 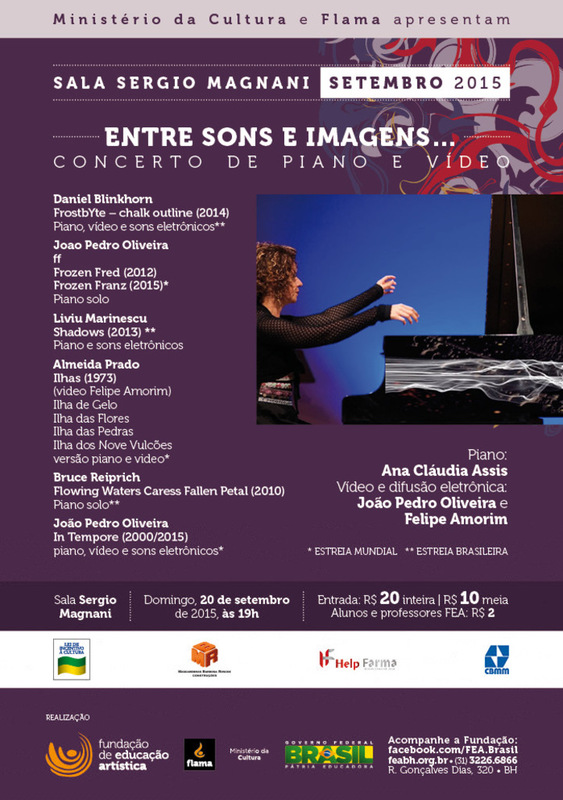 On June 11, Shadows was performed by Brazilian pianist Ana Claudia de Assis in Lisbon, Portugal. Speak & Spell for percussion quartet and electronics was premiered on May 24 in Bucharest, during the International Week of New Music. On May 24, Marinescu gave a composition masterclass at the National University of Music, in Bucharest. On May 21, Marinescu presented a lecture on his music at the National University of Music, in Bucharest. During the last two weeks of May, Marinescu continued his research in musicology at the Schoenberg Center in Vienna. On March 4, Harmonic Fields was performed by Brightwork newmusic at California State University Northridge. Gary Barnett gave a performance of Bent in a piano and electronics recital, presented on July 4 at the Zagreb Music Academy, in Croatia. On June 26, Gary Barnett performed Bent for piano and electronics at the Romanian Cultural Institute in Vienna, Austria. Bent was performed on June 16 by pianist Gary Barnett at the EARS music studio, on the campus of University of California Riverside. On April 22, Harmonic Fields was performed by Ensemble AdHOC at the Gheorghe Dima Music Academy, during the Cluj Modern Festival in Romania. On March 16, San Diego State University Chamber Symphony gave the American premiere of Chamber Concerto for string orchestra, under the direction of Michael Gerdes. Shadows for piano and electronics was performed by Keith Kirchoff at California State University Northridge, on February 22. On February 15, Shadows was performed by Keith Kirchoff at Santa Clara University, during his West Coast concert tour. Pianist Keith Kirchoff gave a performance of Shadows on February 3, at University of Wisconsin Oshkosh. On January 17, Keith Kirchoff gave a performance of Shadows for piano and electronics, at University of North Carolina Pembroke. Harmonic Fields was performed in Paris on December 4 during the Hear Now Festival, at the Mona Bismarck Center. Shadows was performed by Ana Claudia de Assis in Florianopolis, Brazil. On September 14 and 17 Harmonic Fields was performed by the ensemble Oficina Musica Viva in Belo Horizone, Brazil. In June, Gary Barnett gave a performance of Bent at the National University of Music in Bucharest, Romania. Bent for piano and electronics was performed on June 19 at Brick-5 Recital Hall in Vienna by Gary Barnett. Bent was performed on May 31 by Gary Barnett at Moreno Valley College in California. In May, Marinescu presented a research paper on the music of Anatol Vieru at the International Musicology Symposium in Bucharest. Bent for piano and electronics was performed by Gary Barnett at Northern Arizona University on April 27. Ana Claudia de Assis performed Shadows on April 27 at the Universidade Federal de Minas Gerais in Brazil. Marinescu presented a lecture focused on his latest electroacoustic works at Northern Arizona University. Shadows was performed by Dzovig Markarian during the Los Angeles Hear Now Festival on April 23, at the Miles Memorial Playhouse in Santa Monica. Brazilian pianist Ana Claudia de Assis gave a performance of Shadows on April 3 at Northern Arizona University in Flagstaff. On March 30, Marinescu presented a lecture focused on his latest chamber works at UCLA. Bent was performed on March 18 by pianist Gary Barnett at Dixie State University, in St. George, UT. On March 13, Bent for piano and electronics was performed by Gary Barnett at the CSU Northridge Faculty Composers Recital. Sway for percussion and electronics was performed by Anthony Storniolo at California State University Northridge on February 28. Daniel Koppelman gave a performance of Shadows at Furman University on February 17. On February 11, Shadows was performed by Keith Kirchoff at the SEAMUS National Conference, hosted by Georgia Southern University. A video of Shadows recorded by pianist Gary Barnett in Los Angeles is now available on YouTube. A video recording of Keith Kirchoff's virtuosic performance of Shadows at the American Composers Forum 40th Anniversary Showcase Concert is now available on YouTube. On December 11, Gary Barnett performed Bent during the EARS Concert Series at University of California Riverside. Brazilian pianist Ana Claudia de Assis performed Shadows on November 27 in Morelia, Mexico. On November 19, a recording of Bent for piano and electronics was broadcast by the Romanian National Radio. A video recording of Sway for percussion and electronics performed by Aaron Smith at CSU Northridge, is now available on YouTube. Shadows for piano and electronics was performed by Daniel Koppelman on November 12, during the Society of Composers 50th Anniversary Conference at University of Florida. On November 12, Brazilian pianist Ana Claudia de Assis performed Shadows in Monterrey, Mexico. Shadows was performed by pianist Daniel Koppelman in Greenville, South Carolina, on November 3 and November 6. On October 31, Bent for piano and electronics was performed by Gary Barnett at the Steinway Piano Gallery in Pasadena, during the Sound & Fury concert series. Los Angeles City College hosted Marinescu on October 16 for a master class with students in the Music Department and a series of lectures focused on contemporary techniques of composition. A video recording of Sway for percussion and electronics premiered by Anthony Storniolo at CSU Northridge, is now available on YouTube. On October 7 Marinescu presented a lecture focused on advanced techniques of music composition at Chapman University. Pianist Ana Claudia de Assis gave a performance of Shadows at the Belo Horizonte Artistic Education Foundation in Brazil, on September 20. Gary Barnett gave a performance of Bent in a piano recital scheduled at the George Enescu Palace and Museum in Bucharest, on September 13. On September 12, Sway for percussion and electronics was performed by Anthony Storniolo at the Valley Performing Arts Center in Northridge. A recording of Bent for piano and electronics performed by Gary Barnett was released on a compact disc produced by the Society of Composers in Bucharest. Editura Muzicala and the George Enescu Musem in Bucharest published Marinescu's extensive study on the subject of synchronization techniques in Stefan Niculescu's music. A compact disc including Harmonic Fields, Echoes, Focus, Shadows and Sway was released by Centaur Records in August. During the months of May and June, Marinescu was a visiting research fellow at the National Library of Portugal in Lisbon. A comprehensive study called The Concept of Sound Plasma in Horatiu Radulescu's Music was published by the National University of Music in Bucharest. Pianist Gary Barnett performed Bent and Shadows at University of Aveiro in Portugal, on June 2. On May 29, Marinescu presented a research paper on the music of Stefan Niculescu at the International New Music Symposium in Bucharest. Bent for piano and electronics was performed by Gary Barnett at the National University of Music in Bucharest on May 26. On May 18, Marinescu presented a lecture on his recent works at University of Aveiro, followed by a masterclass with the composition students. Gary Barnett gave a second performance of Bent at University of California Riverside on May 17. Bounce solo trumpet and electronics was premiered at CSU Northridge on May 2 by Andrew Duncan. Bach Variations for also saxophone and pre-recorded sound was performed at CSU Northridge by Gabriel Botsford on April 26. Pianist Keith Kirchoff performed Shadows at the American Composers Forum Showcase Concert, in the Landmark Center of St. Paul, MN, on April 17. Pianist Gary Barnett premiered Bent for piano and electronics at Los Angeles City College on April 16. Marinescu was a guest composer at Palacky University in the Czech Republic between March 29 and April 11. Sway for percussion and electronics was premiered at CSU Northridge on March 15. On October 29, Shadows for piano and electronics was performed by Dzovig Markarian at California State University Long Beach. Dzovig Markarian performed Shadows on October 24th in Meng Hall, at California State University Fullerton. On October 8, Harmonic Fields was performed in Bucharest during the CIMRO Days Festival. On May 30, Marinescu presented a research paper on the music of Horatiu Radulescu at the Bucharest New Music Symposium. Shadows for piano and electronics received its European premiere featuring Gary Barnett at the International New Music Week Festival in Bucharest. Shadows was performed at CSU Northridge on May 17 by Gary Barnett. Dzovig Markarian performed Shadows for piano and electronics at University of Southern California on May 11. On May 3, Gary Barnett performed Shadows in the EARS concert series at University of California Riverside. Shadows for piano and electronics was premiered at CSU Northridge on April 27 by Dzovig Markarian. Between March 30 and April 12, Marinescu was a guest lecturer at Olomouc Palacky University, the Janacek Academy of Music and Performing Arts in Brno, and the Ostrava Conservatory in the Czech Republic. Harmonic Fields was performed at the Society of Composers National Conference, held at Ball State University between March 20-22. On December 4 Marinescu presented a lecture focused on contemporary music trends and techniques at the Colburn School of Music in Los Angeles. An art axhibit with works by American painter Jerry McDaniel and featuring music by Marinescu was hosted by the Performing Arts Center at CSU Northridge in September. Shadows and Sway were recorded at CSU Northridge in preparation for an upcoming commercial release. Quodlibet Sonata was performed in the opening concert of the Parma Festival in New Hampshire, on August 15. On May 27 Marinescu was a guest lecturer at Palacky University in the Czech Republic. On May 20 and 22 Marinescu presented two masterclasses in composition at the National University of Music in Bucharest. Moto Perpetuo was performed on April 14 at the Hear Now Music Festival, in Venice, CA. Harmonic Fields was performed at the Society of Composers National Conference, held at Ohio State University between February 13-16. A video recording is now available on YouTube. Shifting Lines was premiered at the Beyond Baroque Gallery in Venice, CA, on February 8. On February 2, Echoes for flute and pre-recorded sounds was performed by the Nimbus Ensemble, at the Bel Air Presbyterian Church, in Los Angeles. A brief interview focused on music composition today and the creation of Echoes has been uploaded on YouTube. A video of Über Alles performed by the Discovery Players on October 29 at CSU Northridge is now available on YouTube. Harmonic Fields received its second European performance on October 7, at the UNICUM New Music Festival in Ljubljana, Slovenia. 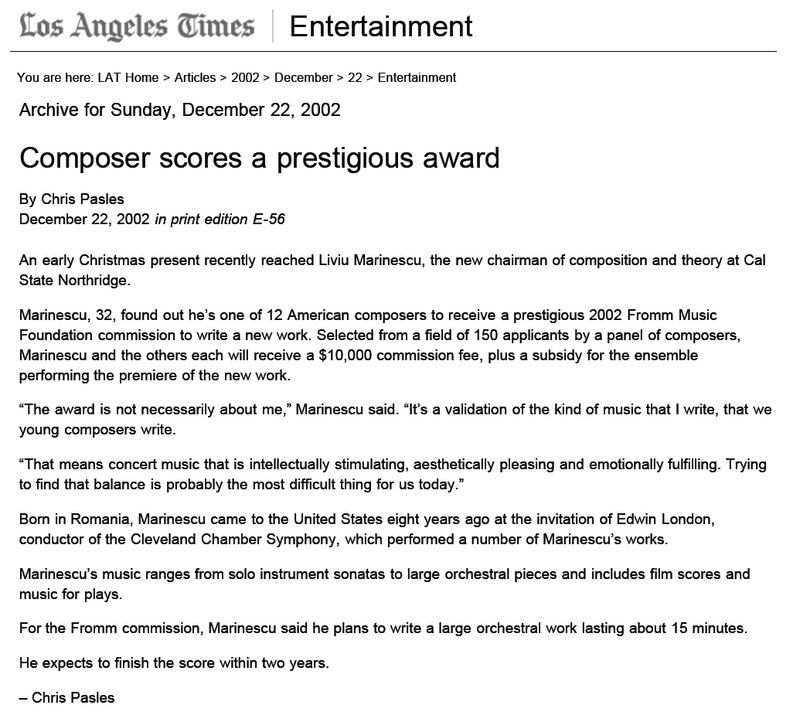 Marinescu received an AscaPlus award from the American Society of Composers, Authors, and Publishers. On September 26, Harmonic Fields was performed at the University of North Carolina Greensboro New Music Festival, following lectures and masterclasses given by Marinescu in the music composition department. A recording of Resonance performed by the Tapestry Ensemble was released by Navona Records in October. On May 21, the Traiect Ensemble gave the European premiere of Harmonic Fields during the International New Music Week in Bucharest. Between May 17 and 29, Marinescu gave masterclasses in music composition and presented a series of lectures at the National University of Music in Bucharest. Following a national call for scores, A-Gain was performed at Bowling Green State University on April 12. On March 11, Echoes and Pastiche were presented by Sarah Wass and Steve Thachuk on the Faculty Composers Recital at CSU Northridge. Echoes and Pastiche were performed at CSU Northridge on March 2. On February 21, Marinescu presented a lecture at University of California Irvine focused on spectral techniques of composition in Harmonic Fields. Moto Perpetuo was performed by the Discovery Players at CSUN on November 14. Tempo music ensemble presented Über Alles at University of Maryland on October 31. Bach Variations was performed by Eric Honour at the Electroacoustic Barn Dance Festival in Virginia, on October 29. Bach Variations was released by Navona Records in August. Homage Collage was performed at the Pasadena Presbyterian Church by Sarah Wass and Traci Esslinger on July 6, at noon. Marinescu was a fellow at the 2011 Composers Conference, held under the leadership of Mario Davidovsky at Wellesley College. An extended interview with Sorina Goia was broadcast by the National Romanian Radio in Bucharest on June 9. Contempo Flux Ensemble performed Harmonic Fields at UCLA on June 5, in the Popper Auditorium. Homage Collage received its European premiere on May 24 in Bucharest, during the International Week of New Music. Harmonic Fields was performed by the Nimbus Ensemble in Westwood, Los Angeles, on May 1. Fragments from John Schneider's April 28 live interview with Marinescu on Pacifica Radio, KPFK Los Angeles, are now available online. Discovery Players gave the second performance of Flux on April 21, at CSUN. Loren Roberts and Hearken Creative Media produced a short film documenting the rehearsal and performance of Harmonic Fields under the leadership of Young Riddle. On April 6, Marinescu presented a lecture on his chamber works at Chapman University. In early April, Nimbus Ensemble recorded Harmonic Fields for an upcoming CD. The North/South Consonance Ensemble presented Moto Perpetuo at Christ & St. Stephen's Church in New York City, on March 14. Flux for three percussionists was featured in the annual CSUN Faculty Composers Recital, on March 13. On March 5, Marinescu gave a lecture on the Quodlibet Sonata during the New Music Festival at CSU Fullerton. Harmonic Fields was performed at Arizona State University on March 4. Moto Perpetuo was performed during the New Music Festival at Florida State University, on January 28. Daniel Kessner recorded Echoes for an upcoming Compact Disc release in Los Angeles. On December 19, Resonance was performed by the Tapestry Ensemble in Paris. 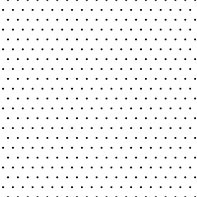 The American Music Center has awarded a grant for the creation and performance of Harmonic Fields in Los Angeles. On November 15, Harmonic Fields for chamber ensemble was performed by the Discovery Players at CSUN. Harmonic Fields was premiered at Northern Arizona University by the Flagstaff New Music Ensemble, on November 14. Bach Variations was selected for recording and release on the Society of Composers annual compact disc series. The Tapestry Ensemble has recorded Resonance in Los Angeles for an upcoming release on Parma Recordings. Moto Perpetuo was performed on May 28 by What's Next Ensemble, during the Los Angeles Composers Project Festival. The European premiere of Echoes was presented by Ana Chifu in a May 26 concert with Ensemble Devotio Moderna, during the International New Music Festival of Bucharest. Echoes for flute and pre-recorded sounds was premiered at CSUN by Daniel Kessner on March 28. A movie of the performance is now available on YouTube. The premiere of Quodlibet Sonata for solo viola was presented at CSUN by Agnes Schwartz on March 21. A brief fragment from this performance can be seen on YouTube. Between December 2 and 23, Liviu Marinescu presented his works and lectured on contemporary American music at the Bucharest National University of Music, in a program sponsored by the Fulbright Commission in Washington D.C.
Resonance for clarinet, oboe and piano was performed on October 18 in the Faculty Recital Series at CSUN. The U.S. premiere of Resonance took place at California State University Dominguez Hills on October 15, in a concert featuring Julia Heinen, Richard Kravchak and Dmitry Rachmanov. Between September 28 and October 1, Marinescu presented four lectures on new music from the U.S. and Romania at the Trondheim Conservatory in Norway. Tempo Music Ensemble gave a performance of Über Alles in Los Angeles, on September 19. On September 14, Moto Perpetuo was performed by the Pearls Before Swine Experience Ensemble at the Musica Viva Festival in Lisbon, Portugal. In June, Marinescu was included on the Fulbright Senior Specialist Roster. Homage Collage was performed at the Brand Library in Glendale, on May 17. On April 20, Homage Collage was presented in a CSUN recital focused on clarinet works written by Los Angeles composers. On April 18, KPCC Radio/NPR Los Angeles broadcasted an interview with Liviu Marinescu discussing the orchestral works of Esa-Pekka Salonen. Bach Variations for alto saxophone and pre-recorded sounds was performed on April 3 by Eric Honour in Santa Fe, New Mexico, at the Society of Composers National Conference. Moto Perpetuo was published by the Society of Composers and Schott Music Corporation in the 43rd volume of the annual SCI Journal of Scores. Postmodern Music in Europe and the United States, an essay which discusses a wide range of chamber and symphonic works written over the past four decades, was published by Editura Muzicala in Bucharest. On November 3, the Swedish group Pearls Before Swine Experience presented in Stockholm the fifth European performance of Moto Perpetuo this year. On October 31, cellist Ovidiu Marinescu performed Quodlibet Sonata at the Barge Music Series in New York City. A compact disc with seven new chamber works was released by Capstone Records in New York. California State University Northridge issued a news release announcing the Capstone Records album. Moto Perpetuo was performed on October 11 in Goteborg, Sweden, at the Geiger Festival. Pastiche was performed on October 5 at California State University Northridge by Steve Thachuk. On June 22, 23, and 24, multiple lectures and performances of music by Marinescu were presented at the Forfest International Festival, in the Czech Republic. On June 19, Steve Thachuk performed Pastiche at the Las Vegas Guitar Festival. A second Romanian performance of Moto Perpetuo by The Pearls Before Swine Experience Group took place in Cluj, on May 31. Moto Perpetuo was performed in Bucharest on May 29 during the International Week of Contemporary Music Festival by The Pearls Before Swine Experience Group. Postmodern Music in Europe and the United States, a research paper focused on works written over the past four decades, was presented on May 27 in Bucharest, during the International Week of Contemporary Music Festival. Instant, Morphing, and Focus were recorded at California State University, Northridge on May 18 by the Nimbus Ensemble, directed by Young Riddle. An avant-garde poetry, music and painting show presented by actress Lidia Lazu, composer Liviu Marinescu and painter Jerry McDaniel premiered in Los Angeles, San Francisco and Palm Springs in early May. Nimbus Ensemble presented the world premiere of Focus and Instant in Los Angeles on April 26, at the Wilshire United Methodist Church, together with the U.S. premiere of Morphing. A documentary about this concert is available on YouTube. Marinescu received the Exceptional Creative Accomplishment Award from California State University Northridge. On April 24, Liviu Marinescu was a guest composer on KCSN Radio, 88.5 FM in Los Angeles. Fragments from his dialogue with Martin Perlich are now available online. Two grants from the American Music Center and Meet the Composer Fund were awarded in support of the creation and performance of Focus, in collaboration with the Nimbus Ensemble. Homage-Collage was performed on October 31 in Trondheim, Norway, by Dolly and Daniel Kessner, who also gave a lecture on music by Liviu Marinescu at Trondheim University. Quodlibet Sonata was performed in Bucharest by cellist Anca Vartolomei on October 26. Loren Roberts and the Hearken Creative Media Studio began filming a documentary on the composition and premiere of Focus in Los Angeles. A-Gain was performed by the Archaeus Ensemble at the prestigious George Enescu International Festival in Bucharest, on September 3. A new recording of Bach Variations performed by Douglas Masek was released by Centaur Records, and can be purchased on Amazon.com. Cellist Anca Vartolomei performed Quodlibet Sonata in Bucharest, on June 12. The Bucharest National Radio (Radio Cultural) hosted Marinescu on three radio shows featuring interviews and recordings on his music. Morphing was premiered at the International New Music Week in Bucharest in May 2007 by the Profil Chamber Orchestra. Marinescu was awarded a grant from the American Music Center for the creation and performance of Morphing in Bucharest. Moto Perpetuo for oboe, bass clarinet, percussion and viola was premiered at California State University Northridge on March 18. Quodlibet Sonata for cello solo was performed at West Chester University, PA on March 8. On February 26, a concert of music by Liviu Marinescu was presented at the Bucharest Music Academy by the Archaeus Ensemble. Homage Collage was performed on February 23, at the Society of Composers Conference hosted by Clarke College, in Dubuque, IA. Duo Perpetuo for bass clarinet and percussion was premiered at California State University Northridge in February by Julia Heinen and John Roscigno. A recording of A-Gain was broadcast by the Czech National Radio on January 10. Article from Los Angeles Times regarding the Fromm Prize.